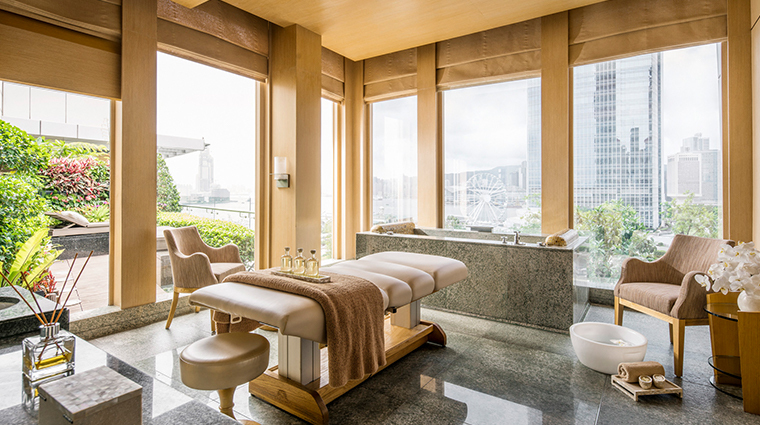 With its enviable location on Victoria Harbour, The Spa at Four Seasons Hotel Hong Kong has views that soothe even the most tightly wound souls. Treatment rooms have oversized windows that frame the cityscape and harbor, or you can choose to close the shades and sink into the table for a pampering treatment. Alongside the list of services you expect to see at one of the city's best spas, this facility adds in more unusual options like jade therapy (the heated stones are supposed to boost your immune system and energy), onnetsu (a massage that incorporates infrared heat therapy) and sessions with a tai chi master. Make time for the Vitality Lounge, with separate spaces for men and women, a playground with a crystal steam room, rhassoul chamber and ice fountains for the ladies, and a flotation tank and Finnish sauna for the men. Also be sure to bring your bathing suit for the harbor-facing pools, including a heated outdoor infinity pool, a whirlpool, a cold plunge and a lap pool. As one of the most popular spas in Hong Kong, the relaxing Five-Star locale strives to be a serene, cozy retreat from the ever-hectic city outside its walls. 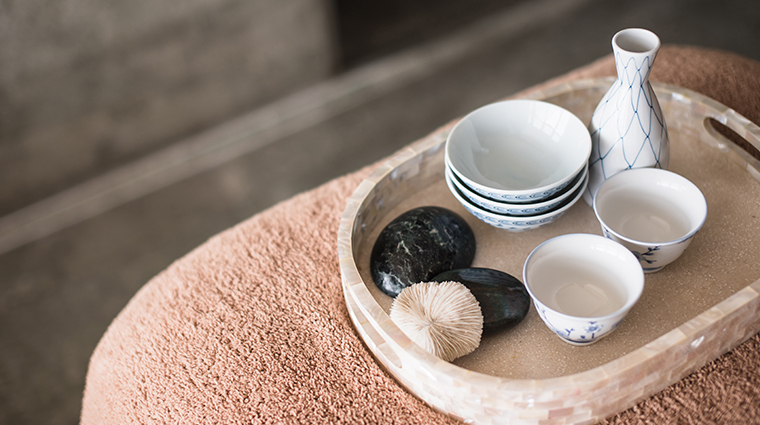 The Spa at Four Seasons Hotel Hong Kong’s philosophy is all about simplicity and results. You will notice a shrinking number of services, but an increase of locally inspired techniques with the intention of offering a personalized focus that will tailor spa sessions to your individual needs. 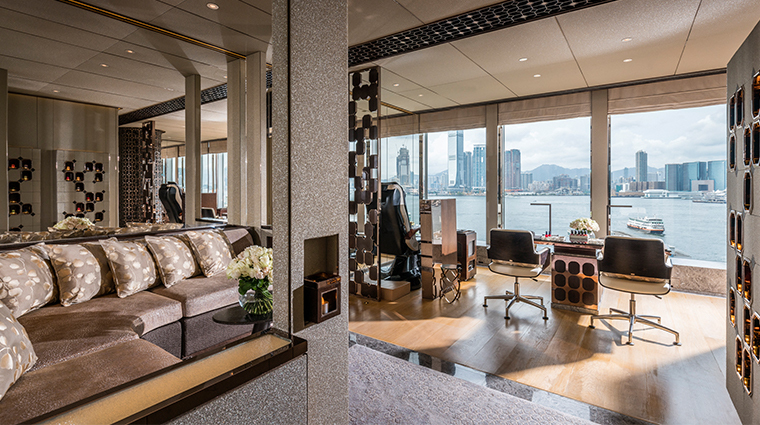 Treatment rooms at the gorgeous Hong Kong spa have three view options: harbor, garden and a combination. Nibble on the tasty housemade marshmallows and sip a cup of steaming tea while you unwind in the waiting area. The excellent therapists are in high demand at this popular spa, and it’s obvious why: we felt like we were in good hands during our treatments — literally. The most coveted treatment room is definitely the harbor view, which is what we had during our treatment. It is beautiful, but with the cityscape and the harbor just outside, you tend to get the noise overflow from Four Seasons Hotel Hong Kong’s popular pool. If you are someone who can’t quite handle being disconnected, some spa rooms have flat-screen televisions that can keep you in the know of the game score or the stock prices. You can head down one floor to the gym as long as you have booked a spa package and not a one-off treatment. We loved how The Four Seasns Fusion combined all of the best aspects of several massage techniques to create an experience that was engaging and relaxing all at once. The hot stones left us in total bliss, especially when they were used to heat up our lower and upper back at different points. The rhassoul lets you play with five different types of mud from all over the world. You are covered in mud — it’s essentially baked on — and then rinsed off in a special room. Instead of a one-type-fits-all massage, have one tailor-made for you. Describe your symptoms and the accommodating luxury spa will match you with the therapist specifically trained in the proper massage therapy and techniques you need. For those who like their backs worked on, the Oriental Back Ritual is divine. You'll get a scrub, steaming towels, Oriental herbs and a deep massage with aromatherapy from camphor-ginger balm. Consider adding a water treatment to your service. A rain forest shower or traditional hammam experience is a refreshing way to end a spa day. Inside the largest spa-retail space in Hong Kong, shop for jewelry, shoes and clothes personally selected by the spa’s tastemaker director. Not to mention, if you really liked what your therapist used during your treatment, you can certainly take that part of the spa home with you. Don’t worry about being cramped in a tiny hotel gym; this fitness center is quite large with several rooms. Run on the treadmill as you look out over the harbor, or try out the row machine, ellipticals, bikes, a power plate or the many free weights. Step inside the locker room and you’ll find an expansive oasis with a sauna, steam room and vitality pool. When it’s time to get back to reality, the beautiful showers and fully equipped vanities will help you be on your way. We seamlessly went from spa treatment to business meeting.